The prolific forward spent two seasons at Old Trafford before joining LA Galaxy. 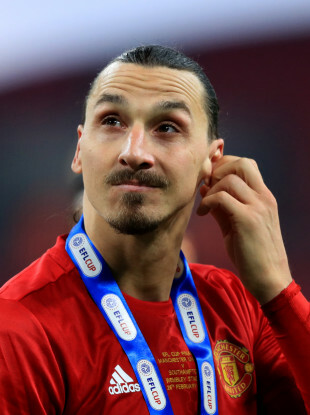 ZLATAN IBRAHIMOVIC HAS revealed he was told by “everyone” not to risk his reputation by playing in England but how a successful spell at Manchester United made him feel young again — “like Benjamin Button”. Ibrahimovic made a major impact at Old Trafford, scoring twice to help Jose Mourinho’s side win the 2017 League Cup final against Southampton before suffering a serious knee injury during the Europa League quarter-final with Anderlecht. “When I went to England I was talking to different players that I knew well and trusted that would give me an honest opinion. From all of them everyone said ‘do not do it’ — they said it would not be good for my career because you put your whole career on one season,” he said. Ibrahimovic, who also played for Ajax, Juventus, Barcelona and both Milan giants, added: “I went against everyone and said that’s what I wanted to do. They thought I was too old… and I made the Premier League look old. Ibrahimovic, who said he had an “amazing” connection with United midfielder Paul Pogba at Old Trafford, said he had felt “unbreakable… like Superman” before suffering his serious knee injury. Email “'They made me feel like Benjamin Button. I was getting younger and younger'”. Feedback on “'They made me feel like Benjamin Button. I was getting younger and younger'”.